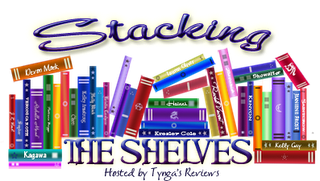 Tynga of Team Tynga's Reviews hosts this meme to spotlight the books we receive each week. I guarantee that your TBR pile will grow when you see all the wonderful books everyone gets. I bought two hardcover books this week because I intend to donate them to my Middle School/High School Media Center after I finish them. I am a big fan of Katie McGarry's work and can't wait to read Nowhere But Here. I was also intrigued by The Girl at Midnight by Melissa Grey and decided to buy a copy. Until I saw it on a list recently I hadn't heard of it. Fantasy is one of my favorite genres. 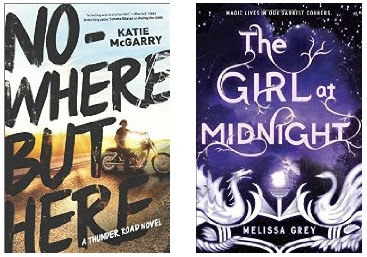 Considering my love of fantasy, this week's SYNC audiobooks were just perfect for me. 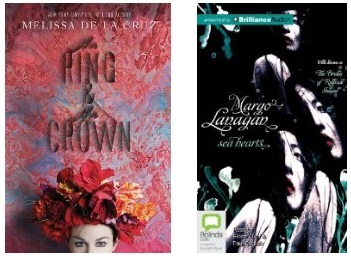 The Ring and the Crown by Melissa De La Cruz and Sea Hearts by Margo Lanagan both sound amazing. What did you add to your stack? Oh nice! I loved Girl at Midnight! Hope you enjoy all the new reads!